Infographic: Which Canary Island Is Right For You? The two most popular Canary Islands, Tenerife and Gran Canaria, attract tourists all year round for different reasons. With a unique landscape that includes everything from volcanic rock formations to endless sandy beaches as well as delicious food and great entertainment, there is a lot to see and experience on these beautiful islands. 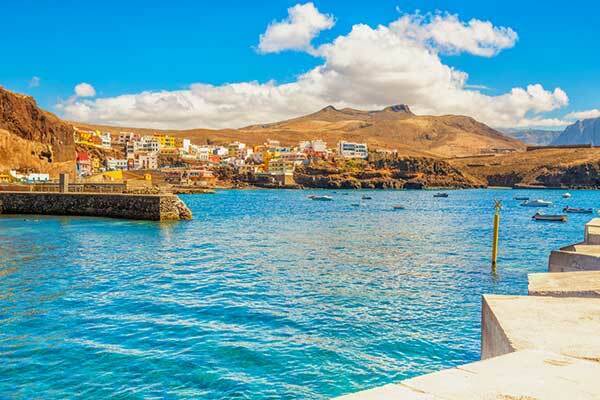 To decide which of these two destinations to choose for your next tropical escape, it’s worth knowing the similarities and differences between Tenerife and Gran Canaria. Tenerife has it all from a National Park where you can explore without meeting a single soul to famous resort areas filled with hotels, shops, and restaurants. The southern part of Tenerife includes Playa de las Americas and Costa Adeje, purposefully built resort areas with lots of things to do amongst which a visit to the Thai-themed Siam Park is an absolute must. This fun water park offers a wide range of attractions from a relaxing lazy river ride to a 28-meter water slide for the boldest of adventurers. Cross the resort borders and discover Tenerife’s unique beauty. Towering Mount Tiede will give you a chance to admire the National Park’s volcanic landscape from the highest point in Spain reaching a whopping 3,718 meters. Although it’s the most popular Canary destination among tourists, Tenerife has countless charming villages for those who prefer to explore the road less traveled. Don’t hesitate to add Garachico, La Orotava, San Cristobal de la Laguna, El Puertito, Masca, and Los Gigantes on your to-visit Tenerife list, because these cuddly, pretty villages will spoil you with the most breathtaking sceneries, lovely atmosphere, and delicious food. Thanks to Santa Cruz de Tenerife’s history of wealth, the city is filled with stunning historic buildings, so don’t miss the chance to admire its beautiful architecture. The capital is well connected to the tourist areas in Tenerife which makes it easy for travelers to visit. mesois one of the city’s highlights. This alluring golden beach boasts tones of imported sand from the Sahara desert. Besides Playa de las Teresitas which is a real treat for bare feet, Tenerife’s Playa de las Vistas is another artificial beach with golden sand, unlike the island’s natural beaches that have volcanic black sand. For a lively atmosphere head over to the gorgeous El Duque beach, on the western tip of Costa Adeje. Cut off by a huge rock which offers a breathtaking view of the sea, and surrounded by luxury resorts this beach is one of Tenerife’s finest. Fañabé beach is perfect for those who enjoy water sports, while La Tejita’s endless sand is reserved for those who enjoy sunbathing for hours. More of Tenerife’s best-looking beaches include Los Gigantes, Masca, El Bollulo, and Playa Jardin. This is the only Canary island with Michelin Star restaurants like Kabuki, El Rincón de Juan Carlos, and M.B. Tenerife offers many flavors to taste from traditional Spanish to Thai, Chinese, and Indian. You’ll also spot a lot of Irish Pubs and global food chains, so there is something for everybody. The best nightlife is in Playa de las Americas with clubs and bars that work until the early morning hours. Despite the rivalry between Gran Canaria and Tenerife, these two Canary Islands are very similar. However, Gran Canaria is a slightly less popular choice than the infamous Tenerife, mostly because the largest Canary island offers a little bit of everything for everybody. Gran Canaria, on the other hand, is famous for its diverse scenery that you can’t find on any of the nearby islands. Don’t be fooled by the unspoiled landscapes, this island also has bustling resort areas, but the best parts are outside of the resorts. There are multiple picturesque towns to visit among which Agaete, Puerto de las Nieves, and Roque Nublo where you can see the stunning terracotta rock formations. The outstanding sands of sare another highlight of the island, with its dunes that will make you think you are in the middle of the Sahara. Gran Canaria doesn’t have the impressive Tiede, but this island won’t disappoint you with its nature and breathtaking views. For hiking enthusiasts, there is a walking festival every October with routes that unveil the most fascinating sights of the island. Las Palmas de Gran Canaria is situated between two mesmerizing bays and their beautiful beaches Playa de las Canteras and Playa de Las Alcaravaneras. The capital’s old town has a rich historical and cultural heritage which is a part of the UNESCO World Heritage Site. In Las Palmas, you’ll find both magnificent sandy beaches and bustling city life. Gran Canaria beats Tenerife when it comes to beaches. 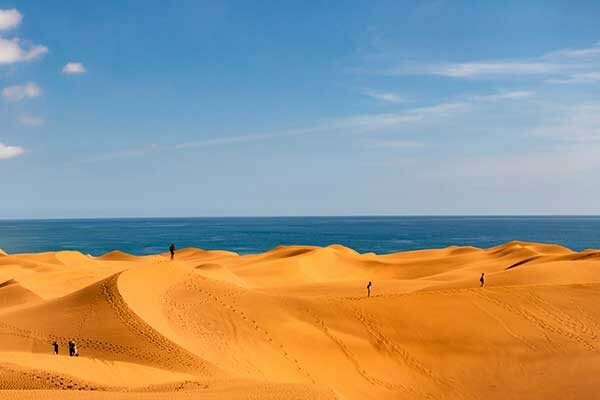 One of the most iconic beaches on the island is the previously mentioned Maspalomas ,which is reminiscent of the desert and includes a nudist zone. Gran Canaria’s Puerto Rico beach has that exotic Caribbean feel thanks to the countless palm trees and azure sky which makes it one of the most beautiful sun, sand, and sea destinations on the island. Other marvelous beaches include Las Canteras, Playa del Ingles, Taurito, and Amadores. Gran Canaria offers dishes from the national cuisine of around 30 different countries, but you shouldn’t miss the chance to taste the delicious Canarian food. You can have a laidback lunch or dinner on some of the open terraces across the island. Party animals should head over to Las Palmas, Maspalomas, or Playa del Ingles for the best nightlife on the island. 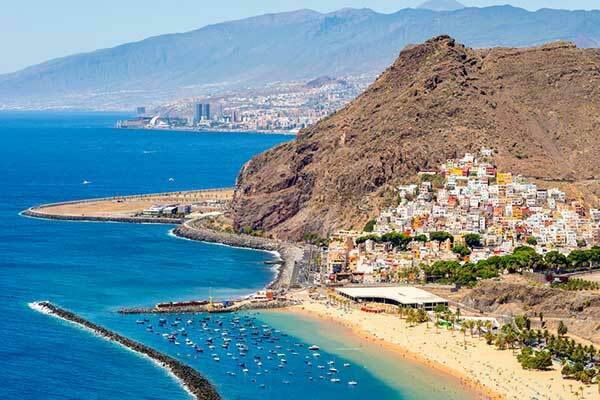 Both Tenerife and Gran Canaria are perfect for people who are looking for lots of diversity in the places they visit. While Tenerife is the most popular tourist destination out of all the Canary Islands, this island has a lot in common with Gran Canaria. With year-round temperatures suitable for catching a tan and swimming, you can book your Canary vacation without worrying about the weather. Go for Tenerife if you prefer popular tourist destinations with great restaurants and nightlife. On the other hand, Gran Canaria is your best bet if you want to explore the breathtaking landscapes and outstanding beaches.